Video for Eric Lindros' official hockey player website. Over the course of his NHL career, Eric Lindros accumulated career totals of 372 goals and 493 assists for 865 points. The 6-time NHL All-Star was the Most Outstanding Player and Most Valuable Player in 1994-95. He was known as ‘The Big E’ within the hockey world. He had both offensive talent and an imposing physical presence. Lindros played eight seasons with the Philadelphia Flyers. Lindros captained the Flyers from 1994-95 through March 1999. Lindros was in over 90 games for the Toronto Maple Leafs. He represented Canada in three World Junior tournaments for Canada (1989-90, 1990-91, 1991-92), serving as captain in 1990-91 and 1991-92, and capturing gold in 1989-90 and 1990-91. He was in the 1991 championship-winning Canada Cup, as a teenager, Lindros also represented Canada in three separate Olympic games: 1992 in France (silver medal); 1998 in Japan (4th place), and the 2002 games in Salt Lake City, Utah. In Salt Lake. He was on the team that won the Olympic hockey gold medal for Canada, for the first time in over fifty years. Lindros was at the 1996 World Cup of Hockey. The Canadians were defeated in the final series by Team U.S.A.
Eric Lindros retired from hockey in November 2007. He now lives in Toronto. After he retired Lindros, wanted the best website possible. That is why he called marketing expert Paul Cookson and his team at Adarmygroup.com. He knew GTA advertising agency was the best marketing and web design team in Toronto. The website marketing expert Paul Cookson made for Eric Lindros showcases the talents of the GTA advertising agency. It has stunning visuals so a viewer can watch video highlights of Eric's playing career or look at photographs from his youth. The site is very easy to navigate, from the homepage to statistics to Eric's bio and booking information. The site is eye catching, informative and fast-moving. The focus of the website is the video on the homepage. Titled "I Like the Big 'E'," it showcases numerous highlights of Eric's career goals, The website video production opening song is perfect with high-energy drums and lyrics. 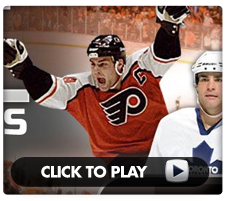 Eric Lindros website stands out from the rest because he chose Marketing expert Paul Cookson at Adarmygroup.com. They deliver total team effort and dedication to the website video production. It doesn't matter if GTA advertising agency is working with a sports superstar or a local company, marketing expert Paul Cookson and his winning team can create not just a website but a total marketing campaign to promote the client to reach the goals they have set. Fresh ideas have GTA advertising agency on top of all the rest. In the age of the internet, it has become necessary for a successful business to have website video production strong internet web design and marketing strategies. Marketing expert Paul Cookson can give your business that slight edge it needs to make it to the top of the online market. GTA advertising agency will be competing with every other business like yours. Marketing expert Paul Cookson can give you the most attractive web design Canada has to offer no matter what you are trying to promote. Marketing expert Paul Cookson can help you with every facet of your marketing woes. GTA advertising agency website video production can craft a comprehensive vision and can make it so that your business stands out from all the rest. GTA advertising agency previous website video production experience with high-profile clients can be scaled to any job, large or small, personal or corporate. Call us at 416.286-2860. GTA advertising agency will make sure the website video production site is properly built, designed for conversion, and optimized for SEO. We have the history and expertise to know what works. GTA advertising agency offer Marketing Consulting; Web Design; Logo Design; website video production and Product Development; and a full SEO package that is designed to bring in website video production.